« Homepage / Food and Healthy Eating / Recipes / "Pepper Crusted Ahi Tuna"
Using a dry clean towel, pat dry your tuna steaks. Lightly drizzle each steak with olive oil and crust with coarsely ground black pepper and salt on each side. Add 2 oz. of olive oil to high heat in a sauté pan, just until the oil begins to smoke. Working in batches, sear the tuna steaks approximately 1–1 ½ minutes on each side until a sweet crust forms. Remove the steaks from the heat and set aside to rest. Deglaze the pan with the white wine, and then add your garlic, ginger, fish stock, and chopped bok choy. Sauté the bok choy over medium high heat for 3-4 minutes. Mound your cooked bok choy on the center of a plate and place the crusted Ahi tuna on top. Place 2 oz. 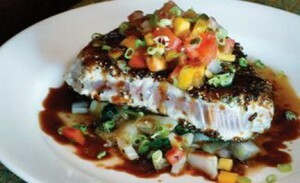 of fresh mango salsa on top of your tuna then drizzle with warm citrus-ginger soy sauce. Remove the stem from your tomatoes and slice in half from top to bottom. Remove the seeds and cut into a medium dice. Peel and dice 1 medium-sized red onion and peel and dice 2 fresh mangoes. Finely chop the cilantro and mix with your diced tomato, onion and mango. Add the juice of 1 lime to the mixture and then season with salt and pepper to taste. Allow to chill for 15 minutes to let the flavors meld. Combine ingredients in a medium sauce pot. Bring to a boil and allow to reduce for 5 minutes. Thicken mixture with approximately ¼ cup of corn starch slurry, made with equal parts of corn starch and water. Here you can write a comment to the post "Pepper Crusted Ahi Tuna"